WE, the Centre for Human Rights Research and Advocacy (CENTHRA) and Concerned Lawyers for Justice (CLJ) condemn in the strongest terms the highly provocative, outrageous as well as downright false tweet by Eric Paulsen of Lawyers For Liberty (LFL) suggesting that the Islamic Development Department of Malaysia (JAKIM) is responsible for fermenting extremism in its preparation of weekly Friday sermons for and on behalf of mosques throughout Malaysia. We note that this tweet is but the latest in a series of tweets by him and LFL that result in further undermining of the position of Islam enshrined within the Federal Constitution as well as having a negative effect of incitement against the Malay Muslim majority population in Malaysia and a chilling consequence for race and religious relations between different classes of the population of our nation. We wholly reject his subsequent hypocritical claim that he was merely criticizing JAKIM as a government agency, especially in light of some of his equally outrageous previous tweets on matters of Islam. 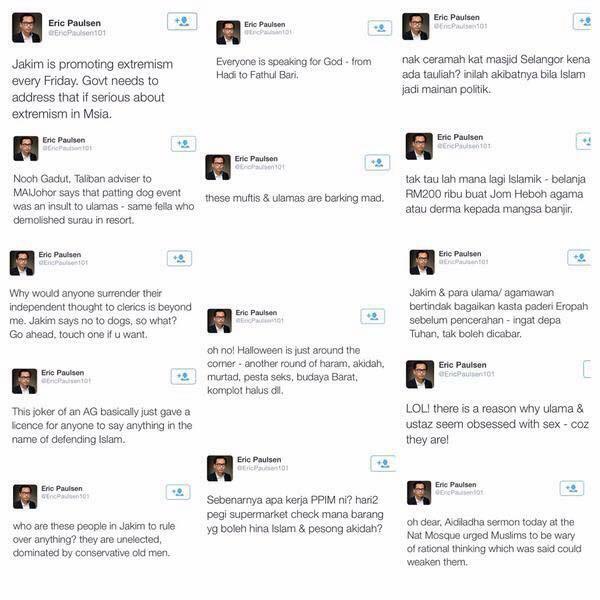 Among Eric Paulsen’s other inflammatory tweets have been that in sermons given during Hari Raya Aidil Adha allegedly urging Muslims to be wary of rational thinking, that JAKIM is a mere unelected body of so-called conservatives with no authority to rule over Islamic affairs; that muftis and ulamas are deranged and obsessed with sexual relations; that PPIM makes deliberate unwelcome visits to supermarkets to ascertain that goods sold do not insult Islam; and calling certain individuals Talibanic. We further note that JAKIM does not prepare Friday sermons for mosques throughout Malaysia, as ignorantly and falsely claimed by Eric Paulsen. It is the respective Religious Councils of each respective States that prepare the sermons, while JAKIM is in charge only for four mosques: namely the Masjid Negara, Masjid Putra, Masjid Sultan Mizan and Masjid Wilayah. We also note that the weekly Friday sermons prepared by JAKIM are anything but extreme. Sermons given in recent times include the need to build caring societies, to jointly prevent corruption, to have integrity as well as to maintain public peace and harmony. We therefore call upon Eric Paulsen to provide evidence of sermons that encourage extremism as alleged by him and verily believe that there are none in this regard. Incendiary statements made by unscrupulous individuals and organisations such as Eric Paulsen and LFL demonstrate an even greater need for the Sedition Act 1948 to not only be retained but zealously enforced, especially against the likes of such individuals and organisations. A multi racial and multi religious society such as Malaysia cannot and must not be allowed to become a playground for those organizations and movements funded by dubious foreign entities to deliberately create destructive social atmospheres in the name of promoting abstract, wholly idealistic and non-realist ideals that are alien to this land as well as its inhabitants. We further believe that should these elements not be kept in check by the authorities, who are charged with keeping public peace and security, and be allowed to fester, then the consequences for our nation would be unimaginable. We call upon the authorities to investigate Eric Paulsen under the Sedition Act 1948 and other laws for making clearly seditious tweets that undermine the position of Islam enshrined under the Federal Constitution, and thereby creating racial discord. We further call upon the authorities to outlaw organizations that have the tendency to be an agent to further sinister agendas of foreign entities. We call upon the Bar Council to take appropriate disciplinary action against Eric Paulsen under the relevant provisions of the Legal Profession Act 1976 as well as the Legal Profession (Practice and Etiquette) Rules 1978 for making seditious tweets in his capacity as a legal practitioner, which quite clearly tarnishes the good name of the legal profession. We further call upon the Bar Council to immediately revoke its resolution of 19 September 2014 calling for the repeal of the Sedition Act 1948, disavow its so-called Walk for Peace and Freedom and memorandum to the authorities on 16 October 2014 further calling for the abolition of that Act, and to wholeheartedly as well as unreservedly support the Act and other laws designed to protect and maintain the Federal Constitution as well as racial and religious relations within Malaysia. January 12, 2015 in Press Statement, Sedition Act.